An enigma to those who knew him, Maurice Ravel (1875-1937) composed some of the most popular and beloved music in the repertory. In Ravel: A Listener’s Guide (November 2015, Amadeus Press, $19.99), Victor Lederer surveys and explores this master’s refined and utterly distinctive oeuvre. Ravel is often mentioned in the same breath as his older contemporary Claude Debussy, but the works of the two composers display as many differences as similarities. Where Debussy rejected existing forms, the structuralist Ravel embraced the baroque suite and classical sonata form as vehicles for his ideas, in addition to his own concise inventions. At his best, which is where we usually find this focused stylist, passion flows just beneath some of the most exquisitely crafted surfaces in music, under which lurk ironies that raise as many questions as answers. A perfect example is Boléro, Ravel’s most famous work, a strange but fascinating experiment that one can hear as maddening or irresistible. Lederer analyzes Bolero and looks at the outsized role it has assumed in our culture. Lederer walks the reader and listener through Ravel’s relatively small but crucial contributions to orchestral, vocal, chamber, and piano music. Ravel’s two operas, idiosyncratic and underappreciated, are examined in detail as well. The book includes a Naxos CD that samples masterpieces from across the master’s career. Victor Lederer is a writer on music and urban history. His books include Beethoven’s Chamber Music: A Listener’s Guide, Beethoven’s Piano Music: A Listener’s Guide, Bach’s Keyboard Music: A Listener’s Guide, and Chopin: A Listener’s Guide to the Master of the Piano, all for the Amadeus Press Unlocking the Masters series. He lives in New York. The newest installment of the Unlocking the Masters Series! The latest installment in the Unlocking the Masters Series from Amadeus Press has arrived: Ravel: A Listener’s Guide by Victor Lederer. 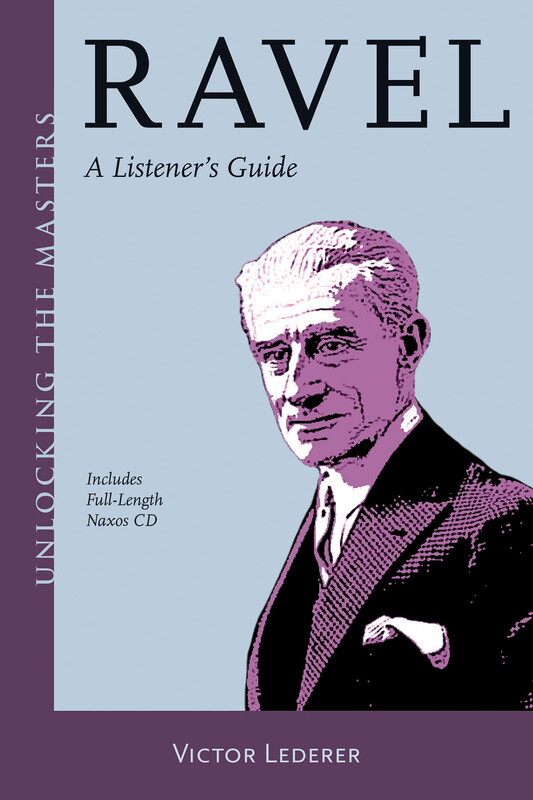 The Unlocking the Masters Series, which now features 23 titles, presents the work of classical composers in a user-friendly style that brings the reader quickly and easily in to the world of the greatest composers and their music. Read below for an excerpt of Chapter one! There’s no question that the beautiful surfaces of Maurice Ravel’s music provide an easy approach, but subterranean strengths are what make it last. So, in one sense, his works hardly seems to need analysis, partially explaining their immense popularity, while the tug of the composer’s sophisticated compositional technique—his tart harmonies and rhythmic playfulness, for example—and his singular way of expressing passion keeps it from superficiality, bringing one back to listen, again and again. Ravel’s style, gorgeous on the outside but steely underneath, derives its irresistible outward beauty chiefly from long-spun melodies as well as some of the most skillful and effective instrumental and vocal writing by any composer in any era. His structural strength comes from rhythmic freedom, harmonic richness, and daring, and formal patterns that are mostly straightforward but well suited to the job. Ravel’s gifts as a composer also include the related qualities of brevity, concision, and momentum: he says what he has to say and keeps moving, never dragging his material out. Much of the master’s oeuvre is in dance form, most famously perhaps his various essays in the waltz, but he also composed in Daphnis et Chloé one of the great ballets. But in several other cases that we’ll see, he also transcribed or otherwise reworked his music into ballets: he seemed to be thinking constantly in terms of its choreographic possibilities. More difficult to explain but present just the same is his ability to evoke passion at a distance, a peculiar skill at which he may be unmatched. […]Ravel’s style always remains clearly and unquestionably his own. Even though you may be able to point at an influence here or there, his integration of them is so complete that there’s never a sense that he’s mimicking or copying—unless, as in a couple of rather minor instances, he wants you to. Finally, within this small output is an unusually high percentage of the composer’s works transcribed from one form to another. There are several reasons for this, and we’ll examine these, as well as the music itself, in chapter 4. I discovered while working on the book that generalizing about Ravel’s music is unwise. For instance, several late-period works are rich and heavily scored, going completely against the prevailing leaner manner. And, while I tend to prefer the piano versions of many works (usually the originals) to the orchestral transcriptions that the composer made later, I found that with Ma Mère l’Oye, I love both the four-hand piano original and the orchestrated version equally. Everything Ravel published was crafted with the utmost care, and you need to hear every note and to keep an open mind. Get yourself a copy of Victor Lederer’s book over at Amadeus Press and let us know your thought on it in the comments below! This Autumn, Amadeus Press will release Verdi: The Operas and Choral Works as part of the Unlocking the Masters Series. Read this glowing, exclusive excerpt from the introduction of the book below. Sooner or later we learn that in this world popularity and quality do not go hand in hand—far from it, in fact. But in the case of Verdi, they do. Giuseppe Verdi, probably the most popular operatic composer of all, brought Italian opera to its peak, single-handedly saving and reanimating this beloved musical genre for the better part of a century. Italian opera of the 1840s, when Verdi came on the scene, was a hodge- podge of formulas spun out by mostly forgotten composers who were at the mercy of fickle audiences, self-promoting singers, and impresarios whose chief personal quality was greed. A few fine composers—Rossini, Bellini, and Donizetti—had by their individuality and hard work carved out niches for themselves, achieving popularity that spread beyond Italy, over Europe, and across the Atlantic. But with the arrival of ambitious new ideas about musical drama, chiefly those of Wagner, German opera had become the avant-garde, what the cool kids, even in Italy, wanted to see. While even the finest works by Italians still sounded beautiful, they were rarely daring. With his musical and dramatic genius and force of character, Verdi gave Italian opera’s tired conventions new life, while continually raising its standards, ultimately adding sixteen indestructible operas (of the twenty-eight he composed) to the repertory. Verdi’s music combines lyricism with power, helping it reach its vast and well-deserved popularity. His operas grab you by the throat, demanding your attention and making submission to their beauty and force your only course. They’re not always subtle, but that’s not generally a quality associated with Italian opera. Verdi refined his style continually, though, and his final opera, Falstaff, is nothing if not subtle. Opera, the Italian variety in particular, may be unsubtle, but it is the best musical formfor the direct expression of emotions, at which it is unsurpassed. By any analysis, it’s one of the most important limbs of the Western musical tree; you can perhaps think of it as standing opposite to German-Austrian instrumental music, which runs to the abstract and intellectual. German opera, the fruit of the romantic era, is moody, grandiose, often mystical. But the goals of Italian opera are the expression of emotions, often in showy ways, and sheer entertainment. To say that opera in Italy fills a much wider position in the national culture than it does in the United States seems a truism; it’s also safe to say that nothing in American culture, where the boundaries between “high” and “low” are written in stone, is analogous to opera in Italy, where it’s accepted by millions as an essential element of their upbringing and national heritage. While Americans and others seem irritated or amused up to a point, or bored by opera; others feel intimidated, and many seem to be put off by its artificiality. But of course, placed in the proper light, any art—and any sport—can appear unnatural. There’s more than a bit of blood sport in being an opera fan in Italy, where fine performances are cheered, and bad ones booed enthusiastically; and where the ability of tenors and sopranos to execute fast passagework and hit high notes with ease and power—or their failure to do so—are applauded or condemned vigorously during performances. Verdi’s popularity in Italy arises, as we’ll see, not only from his role as perhaps Italy’s greatest composer, but also as a symbol of the national spirit during the unification struggles of the mid-nineteenth century. Opera’s noble purpose is to say in music what everyone feels—no more, no less. The big solo numbers, or arias, typically express an emo- tion that the character is experiencing. In a duet, each character’s emotion should be clarified and heightened by the music. Termed affects, these are the feelings we’ve all known from early in our own lives: happiness, grief, anger, fear, and all the others. (It seems curious that opera should not gain a wider response in an age and a society in which open emotional expression is accorded high value.) By Verdi’s time, emphasis had begun to shift toward the expression of more complex psychological and dramatic truth, an art Verdi excelled at and brought to transcendent levels of mimesis. The voice dominates Italian opera, and it is the dominant element of Verdi’s style. His works are written for singers, who at best inhabit their roles and hope to become known as great Lady Macbeths, Rigolettos, or Aidas. Verdi’s mastery of the orchestra was immense, as well, and three of the operatic overtures (Luisa Miller, I vespri siciliani, and La forza del destino) are played in the concert hall. With the exception of a few piano fantasies on Verdian themes by Franz Liszt, there are no suites of material lifted from the operas and played by the orchestra without a singer: the idea itself is preposterous. The opposite holds true for Verdi’s contempo- rary and fellow operatic titan Richard Wagner, whose music has always been excerpted and transcribed for orchestra without voice, and Wagner’s music generally stands up well to the treatment. Verdi came to maturity in an era in which the bel canto style dominated; the phrase means “beautiful singing,” and it’s characterized by elaborate and difficult vocal parts, with lots of high notes for the high voices and decoration of all vocal parts. The voice is what’s on display in bel canto operas, and much of what singers are asked to do requires not only vocal power, but also agility and subtlety. The popularity of singers in Italy, entirely comparable to that of professional athletes, typically rewards those who have mastered this difficult style of singing. As we’ll see, some of Verdi’s operas display bel canto characteristics, though he came into his prime as the style was losing its hold on the public. But even if he had been born a few years earlier, his development as a composer of musical drama would have strained the inherent limitations of the style. But there is more for all of you Verdi fans! This October, Amadeus Press will also release Verdi’s Operas, which studies in detail each of Verdi’s 26 operas, from Oberto to Falstaff. Visit the website for more information about this publication.